The Crystal Gateway Marriott is conveniently located on the DC Metro (WMATA) routes. 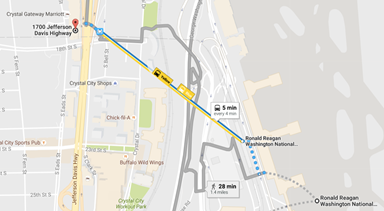 Take the Yellow or Blue line to the Crystal City Station. The hotel lobby is connected to the Crystal City Station through an interior pedestrian concourse within the complex of Crystal City Shops, without going outdoors. The Metro is an excellent way to explore all of Washington, D.C. and the surrounding communities. 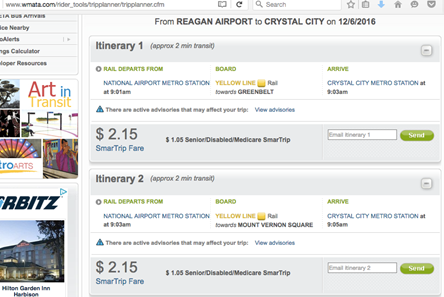 Use the Trip Planner to create a customized route from your location to anywhere else in the D.C. Metro area. Consider purchasing a MetroRail Pass for a day or a week with unlimited travel on the Metro during your visit to Washington. When weather permits, biking is a good way to beat the traffic or enjoy the riding pleasure. CapitalBikeShare is available in the metropolitan area. We suggest you look at the details here: http://www.capitalbikeshare.com/. The area around the hotel has several racks and bikes are usually available. 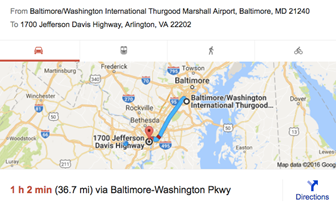 BWI (Baltimore): the airport is located 37 miles from the hotel. 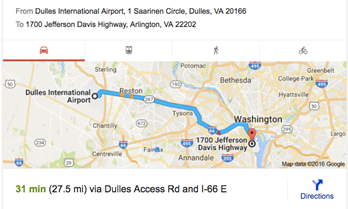 IAD (Dulles): The airport is located 28 miles from the hotel. Uber/Lyft/similar ride sharing options: ride sharing service is a reliable/reasonable cost option around DC. Download the app on your phone before traveling. When you then click on Uber/Lyft, make sure you write (text or call) which door (a number 1 through 10) you are at. The cost of an uberXL is between $65 and $85, while an uberX is between $40 and $50. Taxi: If you choose to take a cab, go down the ramp from the baggage claims at Dulles. The cost of a cab from IAD to the hotel is between US$70 and US$80. DCA: absolutely the closest airport to the hotel: 1.4 miles.